prestigious Subway Magnetic Island Race, while it should also provide a good warmup ahead of October's Coolangatta Gold. The race was without a few of its drawcards, including Penny Palfrey, Alanna Chatfield, Anika Wright and defending Magnetic Island champion Sam Hoffman. 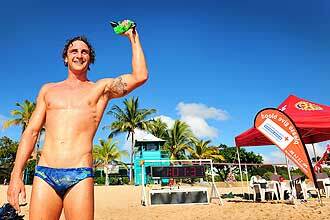 But Townsville Open Water Swimming Association promoter Karen Uhlmann said Lewandowski and Maruna would have proven hard to beat no matter the opposition. "(Lewandowski) is definitely in a very, very high league of open water swimming and he'll be in a very good position going into Coolangatta Gold," she said. "Five minutes on top of our top guys is really, really good, because we have got some really A-class swimmers in Townsville, and Crystal is the same. "They will certainly be up there with the top contenders in the Coolangatta Gold." More than 90 competitors turned out for the 5km and 2.5km events. Eamon Anderson came in third overall, finishing in 1.06:19, with Alyson Downes 30 seconds further behind in fourth and second for the women. In the 2.5km race, Fred Von Knorring (33mins, 33secs) just beat Stefaan Demopoulos (33:28) with Karina Crocker (33.53), the first female, coming in third overall. With the Magnetic Island Swim limited to 100 places this year Uhlmann said competitors would need to register soon for the July 18 race or risk missing out.